Double Comma Vapes is a passionately operated online store based in California. They pride themselves on their product quality, providing the cleanest and purist e-juice available! They control everything that goes into each product and make sure that each flavor is equally delicious to ensure their customers are getting the best products possible. Double Comma Vape's goal is to make their customers happy. They use their loyalty program with Marsello as a way to say, “Thanks for shopping with us” and to encourage their customers to return. They've completely customized their program to suit the Double Comma Vapes brand and have created generous rewards that encourage their members to shop again. Double Comma Vapes have customized their widget by adding their logo and a stylish frame around their widget. They've also created their own program text and points label, making it feel like an extension of their store. DCV customer's earn Gold Points, giving customers the feels of luxury and exclusivity. They also give a generous 200 points to members who successfully refer a friend, landing them just 5 points away from a $5 discount! Their program is easy to find with their loyalty widget tab, as well as links in their store navigation. They have also included a brief introduction about their rewards program in their footer, encouraging their customers to learn more and sign up. 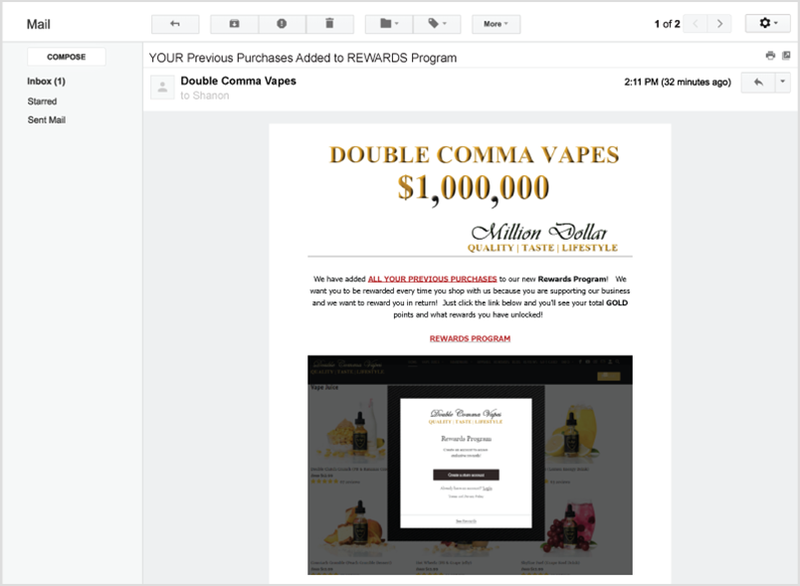 Double Comma Vape's don't stop there though, the link in their store navigation takes curious customers to an in-depth explainer page on how the loyalty program works and the exact conditions of the program. Their launch email generated excitement for their new program. As a generous touch, they also rewarded their existing customers points for previous purchases. This worked as an added incentive for these customers to log in and check their points balance, start exploring different ways to earn more Gold Points, and work towards unlocking rewards. “We were in search of a loyalty program with all the bells and whistles that also provided great customer service. We were giving up hope until we found Marsello. They didn't have a ton of reviews (being a new app), but the ones they had were great, so we gave them a shot. So glad we did, as they have exceeded our expectations! The customer service is top-notch, and the program provides everything you would need for a successful loyalty program. Also, they have tons of help documentation articles for you to read, which helps a lot! 5 stars for this company! " Double Comma Vapes use Stamped.io to allow customers to leave reviews, which they love! They have 383 reviews and counting. Having product reviews on their site helps build customer trust and encourages them to buy. With such a powerful line-up of positive reviews, it's no-wonder DCV are seeing the benefits of adding Stamped to their marketing repetoire. 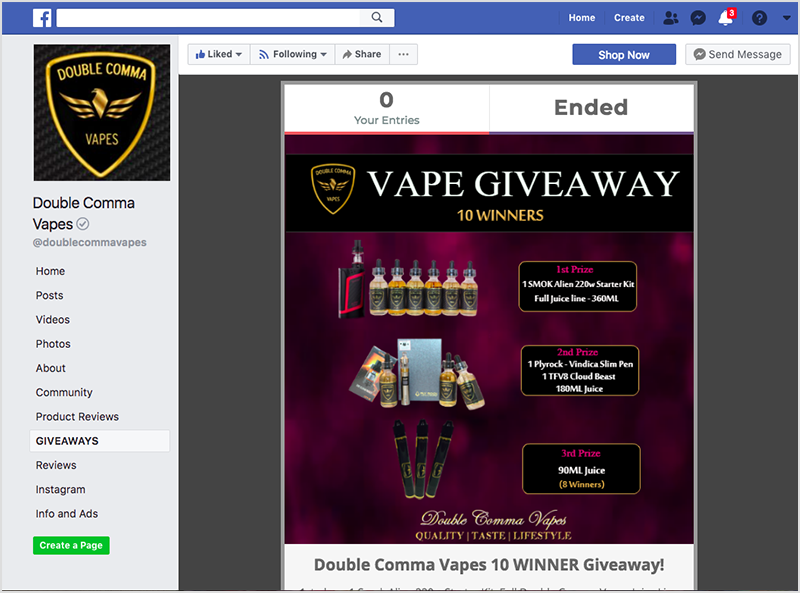 Double Comma Vapes also run competitions through their Facebook business page to give their followers a chance to win Vape Giveaways. 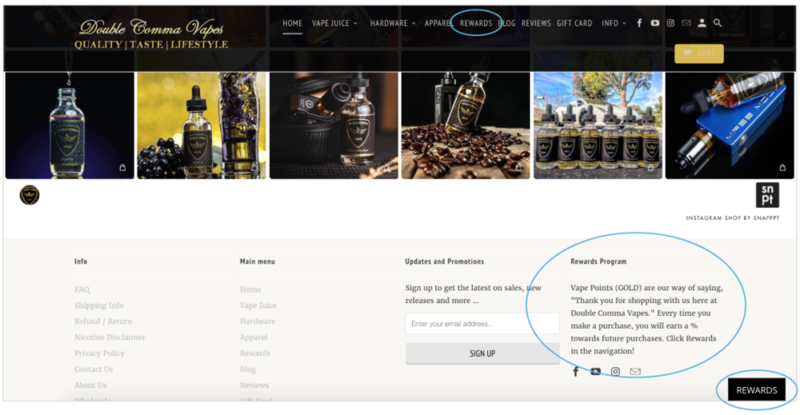 This is a proven and powerufl way to convert their passive followers into customers and encourage these customers to sign up for the generous DCV loyalty program.